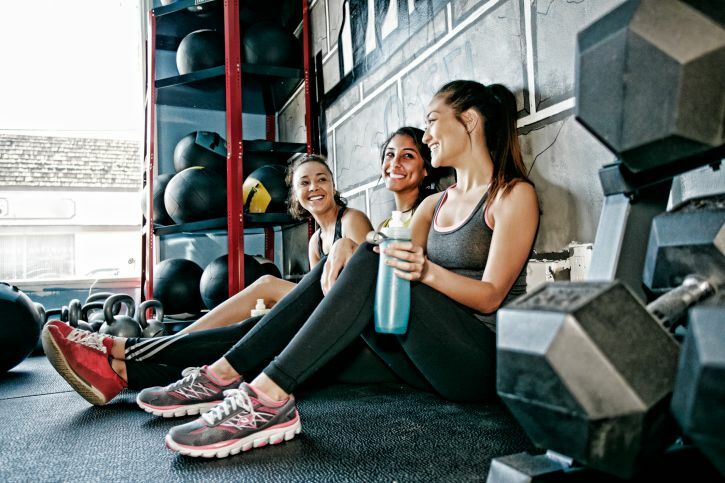 Here are some more tips on how to make a friend connection at the gym. Perhaps the biggest deterrent to meeting new people is giving the impression that you're not interested in conversation. If you're in your own zone and listening to music, you won't come across as someone open to chit-chat. Try skipping the music in favor of scoping out the other exercisers during your workout. Smile and be approachable. Just saying hello to a few folks here and there can lead to making small talk, which is often the first step toward a new friendship. If you're in an area where there is a public television, try commenting on things you see. You will need to gauge the interest of the other patrons in order for this approach to be successful. If the people around you are completely into the program, they probably won't appreciate discussion. However, most folks view the television at the gym as "background noise," and will welcome conversation. Establish a routine when it comes to working out so you can get a feel for the other "regulars" who come to the gym. Observe people who seem to be only into their workout as opposed to those who are looking around. If there is another individual who seems open to conversation, they are probably looking for a friend just like you are. Study their body language before you approach. It should be said that observing at a gym is tricky sometimes. You need to watch what other people are doing, but you definitely cannot stare. Many people feel vulnerable at the gym because they are without makeup and in workout clothes, so feel free to study the surroundings but do it in a way that doesn't creep people out. See if your gym has team sports or other group classes, such as aerobics, racquetball, spinning, water class, or yoga. Joining a class will allow you a few moments to chat with others around you before and after class. If you make the class a regular habit, you'll be able to connect with people on a consistent basis. Strike up a conversation and see what you have in common. Even if your gym doesn't offer a class, you might still be able to connect with people who are training for other exercise events. Many times people who organize local runs or charity walks distribute flyers at the gym. Ask around to see who else might be participating. Very often people shy away from doing an event unless someone else is interested, so this is a prime opportunity to start up a new friendship. You might think that offering to "help" someone exercise is a great way to get to know them, but this can easily backfire if the person isn't open to it. Rather than approach someone to tell them about their form or to show them how to use the machine, simply be open if someone asks you a question. If they want help, they will let you know. The juice bar at my local gym has changed over the years. First, it offered fruity beverages, then it became a snack area, and later it turned into a coffee shop and reading area. Many gyms offer some kind of social area like this, where you can sit back and read or chat with a friend. If you hang out in the social area of your gym, make sure your body language welcomes conversation. Stand with your arms at your side (not crossed in front of you), make eye contact (but don't stare), and smile briefly at the people you see. If you do bring something to read, take several breaks just to look around and see who might be trying to find a friend to talk to. What Are Some Websites That Can Help Me Make New Friends?